As the days shorten and turn colder, winterizing roses should be on the list of garden chores to tackle before the official start of winter. Many roses are hale and hearty, well adapted to winter conditions. Hybrid tea roses, on the other hand, are descended from roses grown in gentler climates, and thus require more protection from harsh winter weather than their tougher cousins require. The steps for winterizing roses depend on your gardening zone and the types of roses you have growing in your garden. Hybrid tea roses, miniature, grandiflora and floribunda roses benefit from some winter protection if the temperatures remain below 20 degrees Fahrenheit for long periods of time. Rosa rugosa and similar species may be tough enough to withstand the elements without protection. You should take steps for winterizing roses before the first really deep frost and certainly before the first snow. A blanket of snow actually acts as an insulator and can help protect roses, but snow cover makes it more difficult to properly prepare the rose bed for winter weather. Stop fertilizing roses in late summer to early spring. You can deadhead roses up until about six weeks before the frost, then you should stop doing that too. Part of winterizing roses is helping them ease into the transition between the seasons, especially those roses descended from plants grown in warmer climates that aren't used to cold weather. The first step for winterizing roses is to protect the base. Mound the soil near the base of the rose bush, pushing it up to make a little hill. The hill should be approximately six inches tall for moderate zones and up to 12 inches tall for northern zones. This task is called hilling. The soil actually brings warmth up to the crown and lower branches, helping them withstand winter's icy onslaught. If the crown of the plant survives, even if branches are damaged by snow and ice, the rose bush can grow back. Next, apply a thick layer of wood chips, pine bark or similar mulch near the base of the plant. Cover the hill. Use branches to hold the mulch in place if rain pushes it away from the plant's crown. 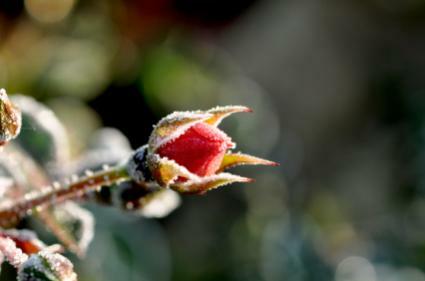 Jackson & Perkins generally recommends pruning roses in late winter, depending on your zone. Remove any dead, broken or diseased branches first. Next, trim the canes down a bit. Any long canes that stick out from the center can become ledges for heavy snow and ice to form, weighing down the cane and snapping it off. You can trim canes by half or one-third without damage. Winterizing roses such as climbing roses requires special care. Ohio State University recommends removing them from their supports, laying them flat and covering the plants, but that's impractical for most home gardens. Instead, you can gather together the tips of the long branches of a climbing rose and wrap them in burlap, using twine to secure the burlap. Be sure to push soil up in little hills around the base and mulch well. Check the trellis or other supporting structure and make sure it is sturdy. If snow or wind takes down the trellis, it can easily snap a climbing rose and damage it. Part of winterizing roses is to clean up the garden to prevent rose diseases the following year. An important task for the flower garden is to remove garden debris such as spent blossoms, leaves, flowers and plants. If you have other flowers growing near your roses, be sure to remove any that have been killed by the frost and rake up leaves in the garden. Dead plant material harbors insect larvae, hibernating insects, and microbes that cause disease. Remove it, bag it, and leave it out for the trash. Do not compost such material. Composting it only spreads diseases and insects through the garden later on. Wait until spring arrives in your gardening zones to push back the hilled soil and uncover the tips of climbing roses. Remove mulch and fertilize with a good rose fertilizer. Roses benefit from regular fertilizer applications, so be sure to get your plants on a good regimen starting in the spring. Winterizing roses sounds like a complicated task, but unless you have an extensive rose garden, it shouldn't take very long. Thankfully, roses may look delicate, but underneath the sweet scents and pretty flowers lies one tough plant. Most roses will survive the winter with minimal care and a gentle touch from the gardener.